Intel has a fairly recent document titled Accelerated Operations for Telecom and Financial Services which is also listed under Accelerate OLTP Database Performance with Intel TSX. It describes the “performance” increases seen with the AsiaInfo ADB from moving from 2.8GHz Intel Xeon E7-4890 v2 (Ivy Bridge-EX), to 2.5GHz Intel Xeon E7-8890 v3 (Haswell-EX), and finally to 2.2GHz Intel Xeon E7-8890 v4 (Broadwell-EX) processors, as shown in Figure 1. This workload is described as “AsiaInfo ADB Database OCS k-tpmC”, while the AsiaInfo ADB is described as “a scalable OLTP database that targets high performance and mission critical businesses such as online charge service (OCS) in the telecom industry”, that runs on Linux. The reason I have performance in quotes above is because what they are really measuring is closer to what I would call capacity or scalability. Their topline result is “Thousands of Transactions per Minute” as measured with these different hardware and storage configurations. The baseline system has a total of 60 physical cores, running at 2.8GHz, using the older Ivy Bridge-EX microarchitecture. The next generation system has a total of 72 physical cores, running at 2.5GHz, using the slightly newer Haswell-EX microarchitecture. Finally, the new system has a total of 96 physical cores, running at 2.2GHz, using the current Broadwell-EX microarchitecture. 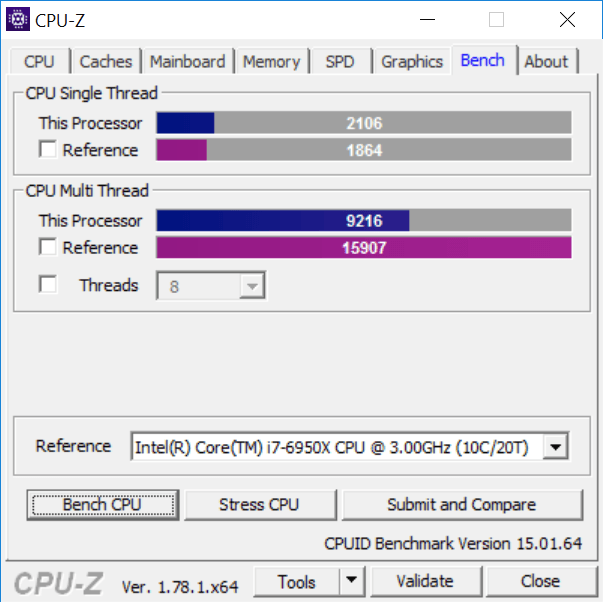 These differences in core counts, base clock speeds, and microarchitecture make it a little harder to fully understand their benchmark results in a realistic manner. Table 1 shows some relevant metrics for these three system configurations. The older generation processors have fewer cores, but run at a higher base clock speed. The newer generation processors would be faster than the older generation processors at the same clock speed, but the base clock speed is lower as the core counts have increased with each successive generation flagship processor. The improvements in IPC and single-threaded performance are obscured by lower base clock speeds as the core counts increase, which makes the final score increase less impressive. Table 2 shows some metrics from an analysis of some actual and estimated TPC-E benchmark results for those same three system configurations, plus an additional processor choice that I added. The results are pretty similar, which supports the idea that both of these benchmarks are CPU-limited. From a SQL Server 2016 perspective, you are going to be better off from a performance/license cost perspective if you purposely choose a lower core count “frequency-optimized” processor (at the cost of less total system capacity per host). This is somewhat harder to do with the Intel Xeon E7 v4 family, because of your limited SKU choices. A good processor choice for many workloads would be the 10-core Intel Xeon E7-8891 v4 processor, which has a base clock speed of 2.8GHz and a 60MB L3 cache that is shared by only 10 cores. If you could spread your workload across two database servers, you would be much better off with two, four-socket servers with the 10-core Xeon E7-8891 v4 rather than one four-socket server with the 24-core Xeon E7-8890 v4. You would have more total system processor capacity, roughly 27% better single-threaded CPU performance, twice the total system memory capacity, and twice the total number of PCIe 3.0 expansion slots. You would also only need 80 SQL Server 2016 Enterprise Edition core licenses rather than 96 core licenses, which would save you about $114K in license costs. That license savings would probably pay for both database servers, depending on their exact configuration. The Intel document also discusses the “performance” increases seen from moving from Intel DC S3700 SATA drives to Intel DC P3700 PCIe NVMe drives. This is going to be primarily influenced by the advantages of being connected directly to the PCIe bus and the lower latency and overhead of the NVMe protocol compared to the older AHCI protocol. Finally, they talk about the “performance” increases they measured from enabling the Intel Transactional Synchronization Extensions (TSX) instruction set and the Intel AVX 2.0 instruction set on current generation Intel E7-8800 v4 series processors. SQL Server 2016 already has hardware support for older SSE/AVX instructions as discussed here and here. I really hope that Microsoft decides to add even more support for newer instruction sets (such as TSX) in SQL Server vNext. On November 21, CPU-Z 1.78 was released. 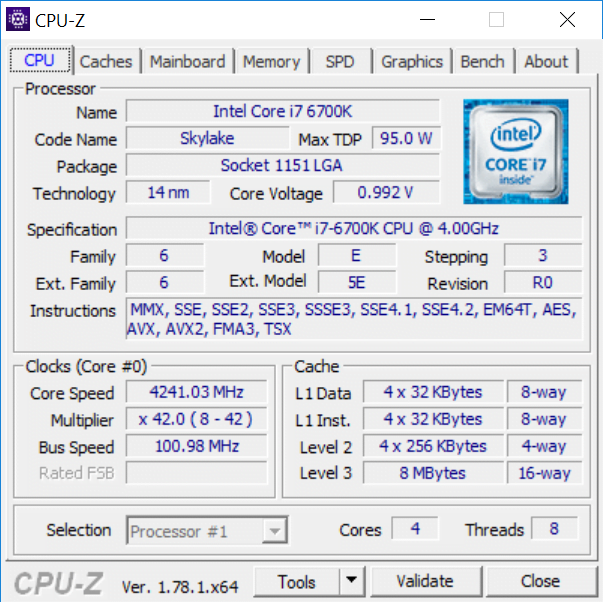 This is a great tool for getting all the technical details about your processors and checking on their current clock speed. The main improvement in this version is support for Intel Kaby Lake processors, which are already available in the mobile space. It looks like the desktop version of Kaby Lake will be released at CES in January. 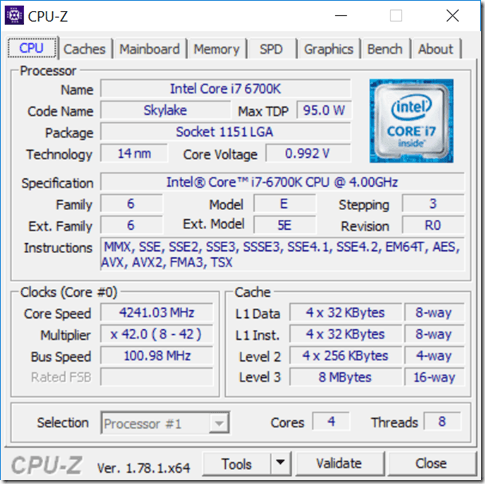 Tom’s Hardware did some benchmarking of an early sample of a Core i7-7700K that someone supplied to them, as detailed here. 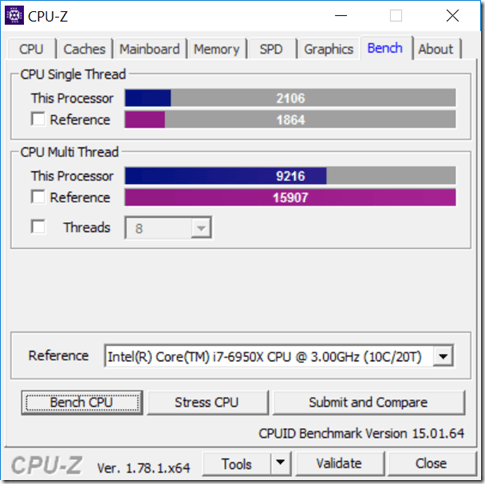 Recent versions of CPU-Z have added a quick CPU benchmarking function that is very useful for running a brief CPU benchmark that measures single-threaded CPU performance and multi-threaded CPU performance. Each test only takes about 7-8 seconds, and is useful for a number of reasons. First, you can get a quick gauge of your single-threaded CPU performance (which equates to the “speed” of the processor), and your multi-threaded CPU performance (which equates to the CPU capacity of the entire system). This is useful for comparing different processors and systems, whether they are physical or virtual. You can measure the performance of a VM versus running bare metal on the host, or you can measure different VM configurations. You can also compare your numbers to the built-in reference processors, or submit your results and compare them to other systems results that are stored online. Second, you can use the Bench CPU button to briefly stress your processors, and then quickly switch to the main CPU tab while the test is running, to see what happens to your CPU core clock speeds, in order to understand whether you have power management configured correctly to get the performance benefits of Intel Turbo Boost. Microsoft has released SQL Server 2016 RTM CU3 (Build 13.0.2186.6), with 31 fixes in the public fix list. They have also released SQL Server 2016 Service Pack 1 (Build 13.0.4001.0). As they previously did for SQL Server 2014 SP2, Microsoft has managed to include all of the hotfixes from the latest SQL Server 2016 RTM CU3 in SQL Server 2016 SP1 RTM, including the very recent security fixes in Security Update MS16-136, so there is no need to wait for a subsequent SP1 CU to get caught up with the latest fixes from the RTM branch. The Microsoft SQL Server Release Services Blog has a lot more detail about SQL Server 2016 SP1 here. The Data Platform blog has more detail about SP1 feature improvements here. Given all of the feature changes and other useful improvements in SQL Server 2016 Service Pack 1 (on top of all of the hotfixes), it is almost a no-brainer to move to SQL Server 2016 Service Pack 1 as soon as you can do your testing, and plan and implement your deployment. This is also a good time for organizations that are running down-level versions of SQL Server Standard Edition to seriously consider upgrading to SQL Server 2016 Standard Edition (preferably on new hardware, running Windows Server 2016).